If 2016 was the year of the Rolex Daytona Ceramic, then 2017 is without a doubt the year of Paul Newman’s Daytona. By now you’ve probably heard that The Wall Street Journal announced back in June 2017 that not only has the unicorn of vintage watches been located, but it also went up for auction. On October 26, 2017, to be exact, by Phillips during their inaugural New York City watch sale dubbed WINNING ICONS – Legendary Watches of the 20th Century. And with a hammer in hand, auctioneer Aurel Bacs created magic on that day. This watch in my hands is Paul Newman’s ‘Paul Newman’. 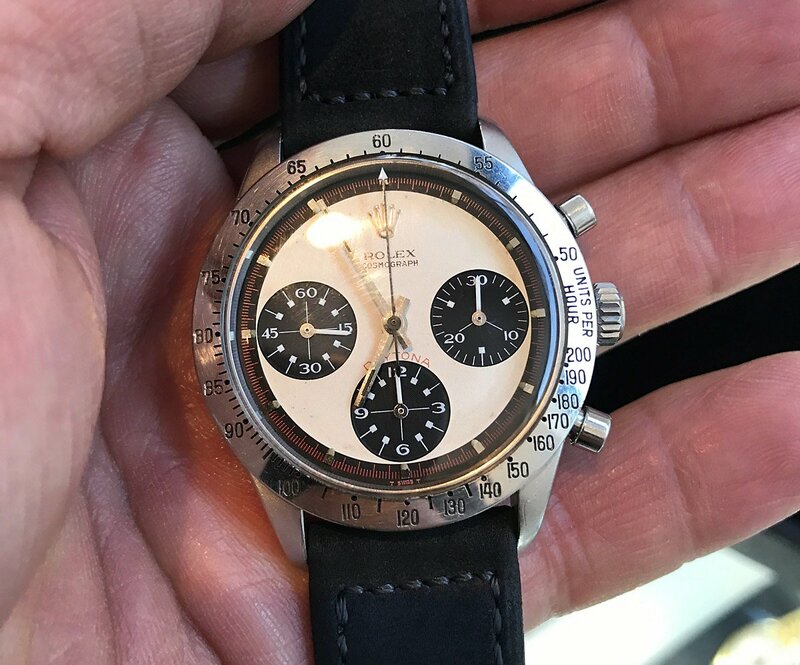 While most people may fondly remember Paul Newman as a great actor, or an avid racecar driver, or a generous philanthropist, or even a purveyor of delicious salad dressing, watch enthusiasts credit him as the man that catapulted one of the worst selling Rolex watches to grail worthy status. A Daytona “Paul Newman” watch is one that sports what Rolex called an “exotic dial,” featuring three colors and Art Deco details. Too exotic for the era, these Daytona models gathered dust on boutique shelves around the world with not much interest from buyers at all. However, thanks to a now-famous photo of Paul Newman wearing his Daytona ref. 6239 on a black leather fat strap, this failed start quickly changed course. 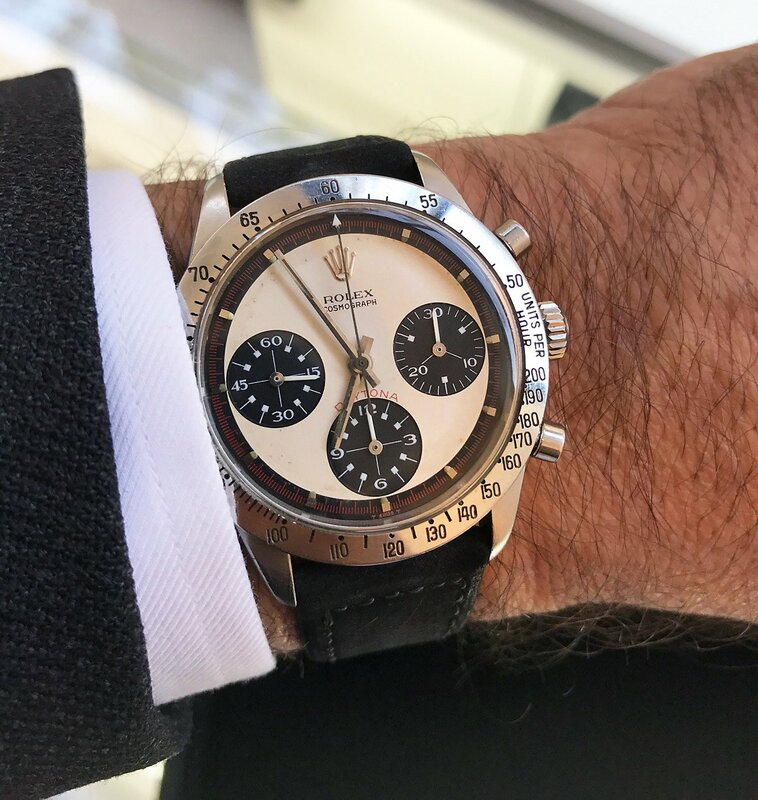 Italian watch dealers took note of the celebrity connection and began referring to the exotic dial Daytona watches as the Daytona “Paul Newman” and the rest is watch-collecting history. It is that exact Rolex Daytona ref. 6239 “Paul Newman” that is going up for auction in less than a week. The location of the watch—and that it even still existed—was unknown until the recent announcement of the sale. The whereabouts of Paul Newman’s ‘Paul Newman’ were unknown until recently. Last week during a special preview in Los Angeles of the upcoming lots, I had the immense privilege of seeing the watch in the metal. But even better, I was also given the opportunity to try it on! 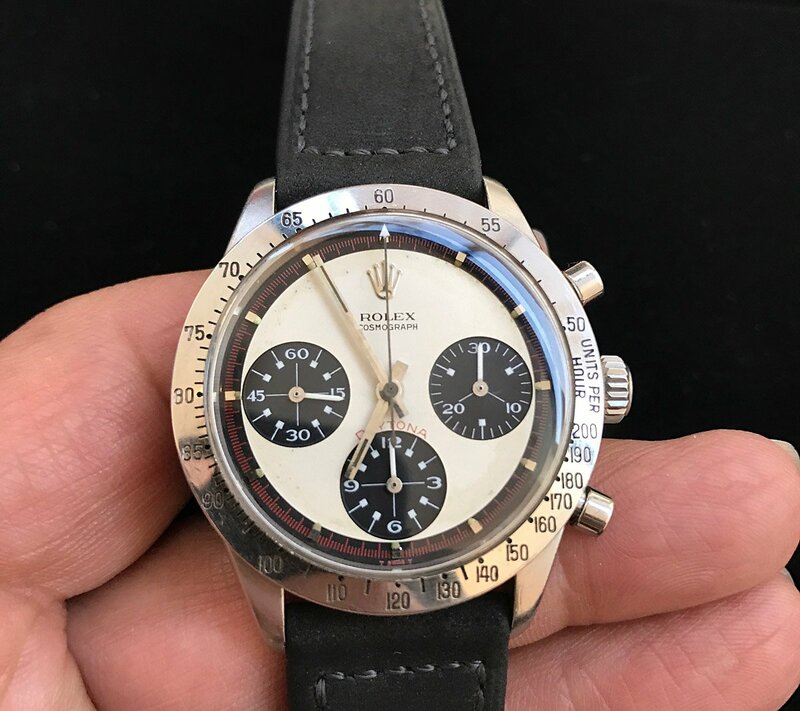 As a vintage Rolex watch collector myself with a keen interest in Daytona Paul Newman models, it’s hard to put into words how it felt to have Paul Newman’s “Paul Newman” on my own wrist. The steel Oyster case with the duo of pump pushers flanking the crown, the tachymeter-engraved steel bezel, the creamy dial with the trio of black registers marked by those distinct numerals, the red outer minute track, the secret message on the case back, the famous coronet sitting on top of the ROLEX COSMOGRAPH name, the prominent red “DAYTONA” arched above the bottom subdial—it was all just perfect. The watch’s provenance, significance in the market, and surprisingly great condition left me pretty much speechless. Paul Newman’s ‘Paul Newman’ on my wrist. To label today’s market for vintage Paul Newman Daytona chronographs as strong does not do it justice. The buzz around these particular watches is near-hysteria. And frankly, after the sale of Paul Newman’s “Paul Newman,” interest is just going to skyrocket even more. The news of the sale result will go well beyond the watch collecting community to the public at large and those who aren’t well versed in mechanical watches will start investigating how an old stainless steel manual mechanical watch sold for the millions it did. While the pre-sale estimate is “in excess of $1 million” it will no doubt cost the new owner much, much more than that. Stay tuned to find out what the price to own a piece of horology history will be. How much do you think Paul Newman’s Paul Newman Daytona will sell for?